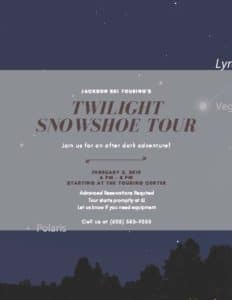 Snowshoe with the light of the moon (and Jackson guides) in Jackson Village. We’ll tour from the center and gather back to toast marshmallows on the patio! $20 per person; register by calling 603-383-9355 or in person at the Touring Center.